If you suffer from a bulging belly, excess abdominal fat, saggy skin, or stretchmarks on your belly, you may want to restore your flat tummy with a tummy tuck. At Serrão Rejuvenation Center, Dr. John Serrão, a board certified gynecologist and post-graduate trained cosmetic surgeon, specializing in cosmetic surgery of the female body, offers tummy tuck procedures for women in Orlando, Winter Park, and the surrounding areas of Florida. Tummy tuck surgery, or abdominoplasty, can flatten your abdomen by removing loose, excess fat and skin and tightening muscles in the abdominal wall. It can also remove some, if not all of the stretch marks in your lower abdomen. It is popular following pregnancy, weight loss, or whenever a flabby abdomen with weak muscles impairs your body contour. With that being said, pregnancy and other conditions may impair your body contour by stretching apart the inner tissue and muscles of your abdomen. Once stretched, you see an unflattering, bulging belly look. These widened and stretched muscles can also be corrected with abdominoplasty. Called muscle plication, it brings the muscles together in the midline and results in a very flat stomach. No matter how many crunches you do, you just can’t seem to get those abdominal muscles to look good unless you do this muscle tightening technique. Abdominoplasty is one of the most popular cosmetic procedures performed and can help you feel confident again! At Serrão Rejuvenation Center, we combine extensive liposuction to the abdomen and waistline, combined with a tummy tuck to give you a beautiful, flat tummy and contoured curves for a more feminine silhouette. Dr. Serrão’s lipoabdominoplasty procedure provides you the best results for a more desirable figure and reduces the risks of many of the complications that are associated with traditional abdominoplasty surgery. Performed while you’re awake using tumescent anesthesia and mild sedation, the lipo-abdominoplasty procedure is very safe and effective. Without the need for general anesthesia, you avoid many potential problems while getting the same great results. Compared to traditional tummy tucks, this new technique more likely preserves the blood circulation to the areas that are sometimes destroyed using older methods. With better blood supply preservation, the tissues heal better and allow for better results. In addition, this significantly reduces the chance of developing many potential complications, such as infection, hematomas, skin sloughing, and abnormal clotting problems. You can now have that smooth and flat abdomen you’ve always wanted yet were afraid to do so because of the potential complications that were more common in the past. The mini tummy tuck is called the mini because it removes a smaller amount of skin, and because the incision is usually smaller. The mini tummy tuck is best for women with a “mini” amount of stubborn belly flab that is resistant to diet and exercise. This procedure is ideal for generally healthy patients who want to lose that “pouch” of skin in their lower abdomen. Dr. Serrão will administer the tumescent localized anesthesia and perform the liposuction of the abdomen and waistline. Once the liposuction is complete, an incision is made to remove minor excess skin, tighten the abdominal muscles if needed, and then pull the remaining skin taut to close the incision. The umbilicus (belly button) itself usually doesn’t have to be re-positioned during the mini tummy tuck procedure. Recovery times will vary from patient to patient, but with use of medications and avoidance of intense physical activity, most women should be able to resume light activities in about one to two weeks. The traditional tummy tuck is ideal for women who are in good physical health, but have a larger portion of loose skin to remove from their midsection. Oftentimes, traditional tummy tuck patients have recently lost a great deal of weight, or are women who have excess flab and/or weak abdominal muscles after pregnancy. This procedure is for patients who couldn’t reduce their abdomen through diet and exercise alone and is not meant to replace a healthy lifestyle. For the traditional tummy tuck, the surgical incision is larger, usually in a straight or curved line between the hip bones. Local tumescent anesthesia and IV sedation are administered to maintain your comfort and safety during the procedure. Once the liposuction of your abdomen and waistline is complete, the incision is made to remove excess skin and tighten the abdominal muscles. Because the standard tummy tuck involves a larger portion of skin removal, the umbilicus (belly button) must be correctly re-positioned. Once the new umbilicus is completed, the remaining skin is pulled taunt and the incision is closed. The average recovery time for traditional tummy tucks is two to four weeks, during which time pain medication is prescribed to prevent unnecessary pain or discomfort. Dr. John Serrão is an experienced doctor who has performed hundreds of tummy tuck procedures with results that his patients have been very pleased with. As a cosmetic gynecologist, he has performed thousands of intra-abdominal surgeries and caesarean sections over the past 30 years and has extensive knowledge in abdominal surgery. He possesses the artistry and skill that is required to achieve the desired cosmetic result for body contouring procedures. Lipoabdominoplasty can give your body a more feminine silhouette with a natural look of subtle perfection. 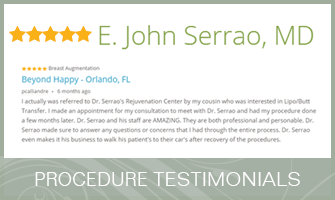 Serrão Rejuvenation Center is conveniently located in Orlando and our highly trained team is prepared to deliver the highest quality of care. A tummy tuck flattens and tones your midsection. At Serrão Rejuvenation Center, Dr. John Serrão, a board certified gynecologist and post-graduate trained cosmetic surgeon, specializing in cosmetic surgery of the female body, offers tummy tuck procedures for women in Orlando, Winter Park, and the surrounding areas of Florida. Contact us to schedule a consultation and begin your rejuvenation today. If you suffer from a bulging belly, excess abdominal fat, saggy skin, or stretchmarks on your belly, you may want to restore your flat tummy with a tummy tuck. At Serrão Rejuvenation Center, Dr. John Serrão, a board certified gynecologist and post-graduate trained cosmetic surgeon, specializing in cosmetic surgery of the female body, offers tummy tuck procedures for men and women in Orlando, Winter Park, and the surrounding areas of Florida. A tummy tuck flattens and tones your midsection. At Serrão Rejuvenation Center, Dr. John Serrão, a board certified gynecologist and post-graduate trained cosmetic surgeon, specializing in cosmetic surgery of the female body, offers tummy tuck procedures for men and women in Orlando, Winter Park, and the surrounding areas of Florida. Contact us to schedule a consultation and begin your rejuvenation today. Lipoabdominoplasty, also known as a tummy tuck, is a cosmetic surgery procedure which combines liposuction of the abdomen and waistline, tightening of the abdominal muscles (if required), and removing excess skin and fat of the middle and lower abdomen to produce a flatter and more toned appearance. After the liposuction of the abdomen and waistline is performed, the abdominoplasty procedure will begin. The incision for the full abdominoplasty is located just above the pubic area running from hip bone to hip bone, and a second smaller incision is made around the umbilicus (belly button). Working through the incisions, the abdominal muscles are tightened if necessary, excess skin and fat are removed, and the skin is pulled tight. The umbilicus has a new hole cut for it and is stitched into place. For a mini abdominoplasty, a smaller incision is made and the second incision around the umbilicus will not be necessary. Lipoabdominoplasty procedures are performed in our accredited surgical center in Orlando. Our desire is to offer patients a comfortable environment where they can have their body sculpting procedures performed in a center that has fulfilled the safety requirements and standards of care of one of the most prestigious accreditation associations of the United States, AAAHC. Tumescent local anesthesia with moderate to deep sedation will be used for the tummy tuck procedure. How Long Does a Lipoabdominoplasty Take to Perform? A full abdominoplasty takes between two and five hours to perform, while a mini abdominoplasty can take one to two hours. Where Are the Incisions Made for Lipoabdominoplasty? The incision for a full abdominoplasty runs from hipbone to hipbone just above the pubic area, and a second smaller incision is made around the umbilicus (belly button). A mini abdominoplasty involves a smaller incision and the second incision around the belly button will not be necessary. The incision for a full abdominoplasty usually runs from hipbone to hipbone, and may be in a V-cut or U-cut shape, so that the scar can be hidden in a bikini. Dr. Serrão will determine the shape and length of the incision based on your preferences and the amount of correction you need. You will also have an incision around the umbilicus (belly button). With a mini tummy tuck, Dr. Serrão will place the incision as low as possible; it can be hidden in the pubic bone area. The abdominal skin that is removed is below the belly button, and there are no incisions around the belly button. The length of the mini-tummy tuck incision will vary based on how much skin needs to be removed. Scarring is less extensive for a mini abdominoplasty, as the incision is a smaller one. How Do I Know Which Tummy Tuck I Will Need? If your abdominal fullness and loose skin are confined to the area below the belly button, you may be a candidate for a mini abdominoplasty, which has a shorter incision and limits the tightening to the lower abdomen. If the fullness and skin laxity involve your entire abdomen, then a full abdominoplasty is most likely needed to help you achieve your desired results. A consultation with Dr. Serrão will determine which method is right for you. What is the Cost of Lipoabdominoplasty? The cost of lipoabdominoplasty varies from patient to patient depending on the amount of correction that is needed and the type of tummy tuck performed. All of our fees will be discussed with you during your consultation. You will find our charges to be very fair and competitive for the Orlando area. Several financing options are also available at Serrão Rejuvenation Center and we offer package pricing. We welcome you to call our office for more details on fees, and be sure to check our current specials. What is the Recovery Like After Lipoabdominoplasty? Recovery generally takes two to four weeks after any abdominoplasty. Patients can expect some swelling and bruising and this may take several weeks to several months to fade. In addition, a support garment will need to be worn around the abdomen for a period of time. Does Lipoabdominoplasty Involve Much Pain? There will be some moderate discomfort after abdominoplasty that can be controlled with medication. There is less discomfort with a mini abdominoplasty. Patients may be able to return to work in four weeks after the full abdominoplasty procedure and two weeks after the mini abdominoplasty procedure. Can Exercise Tighten the Skin Without a Tummy Tuck? Unfortunately, no. Exercise is good for the mind and body in general, and toning the muscles can help fill out loose skin in the vicinity. By suppressing the appetite, and by slightly increasing the metabolism, exercise can assist weight loss. But there is no such thing as a “spot” exercise to make the body lose weight in a certain area, nor to make the skin tighter. Exercise can increase muscle bulk, and that in turn can make skin look tighter in some areas, but exercise cannot tighten the loose abdominal skin. How Do You Avoid an Unnatural Looking Tummy Tuck Result? Creating natural-looking contours of the body requires artistry, good judgment, and excellent technique. Dr. Serrão takes pride in creating natural appearing tummy tuck results, and is sought after by patients from around the world for his body contour procedures. Who is a Candidate for Lipoabdominoplasty? The best candidates for lipoabdominoplasty are patients in good health with realistic expectations that want to improve their body contour with a slimmer silhouette. A tummy tuck does not replace a healthy lifestyle and is not intended for weight loss. How Do I Learn More About Lipoabdominoplasty? Schedule a consultation to learn more about the tummy tuck procedure. The educational consultation is of great importance at Serrão Rejuvenation Center and our patients find it to be very informative. You will meet our caring team and tour our state-of-the art facility and AAAHC-accredited surgical center. Dr. Serrão and his cosmetic nurse, Larissa, are dedicated to answering all of your questions and will make you feel comfortable with their friendly demeanor. After reviewing your medical history, Dr. Serrão will listen to your concerns and expectations, perform a complete assessment, and educate you on the options that you have based on his expert recommendations. Together, you will develop a treatment plan that will fit your lifestyle and budget. You may choose to schedule the procedure at the time of your initial consultation, or you may decide at a later time. The consultation is about 30 minutes to one hour and the applicable fee will be applied towards the procedure or any purchase in our practice. Whatever your decision, it will be our pleasure to assist you in any way that we can.